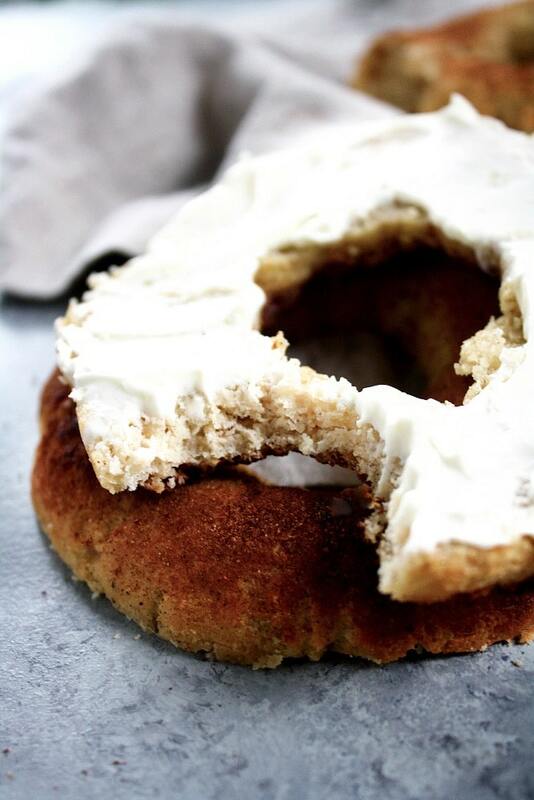 Low-Carb Cinnamon Sugar Bagels?! YES PLEASE. If you’ve been following a low-carb diet for any period of time (even as short as 30 seconds), you’ve probably dreamt about bread. Soft, warm, DELICIOUS bread. I love you and I’ve missed you. 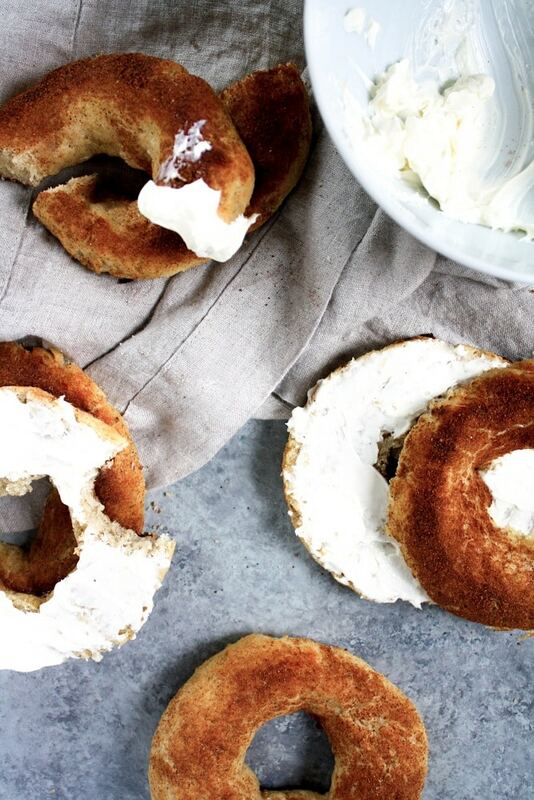 Did you know that most store-bought bagels have OVER 50g carbs in just one bagel?! If you follow a low-carb diet, bagels are just not an option. 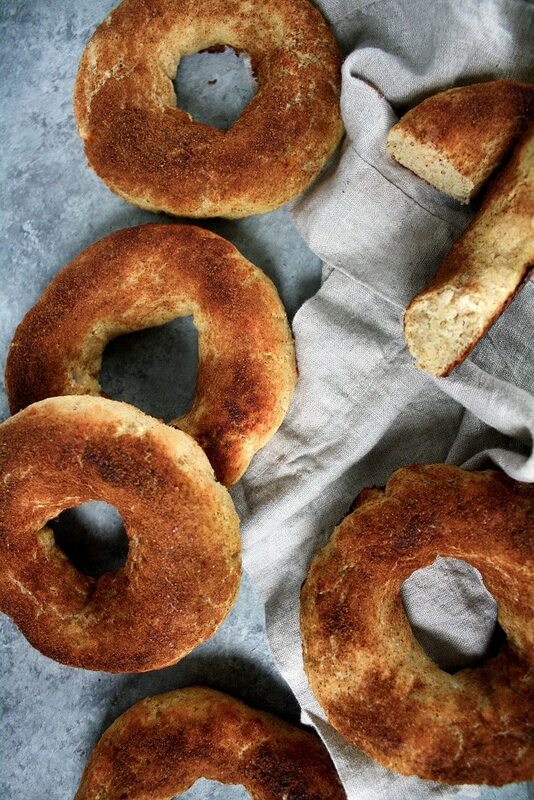 But, with this recipe for Low-Carb Cinnamon Sugar Bagels in your wheelhouse, you will no longer be denied your bagel fix! 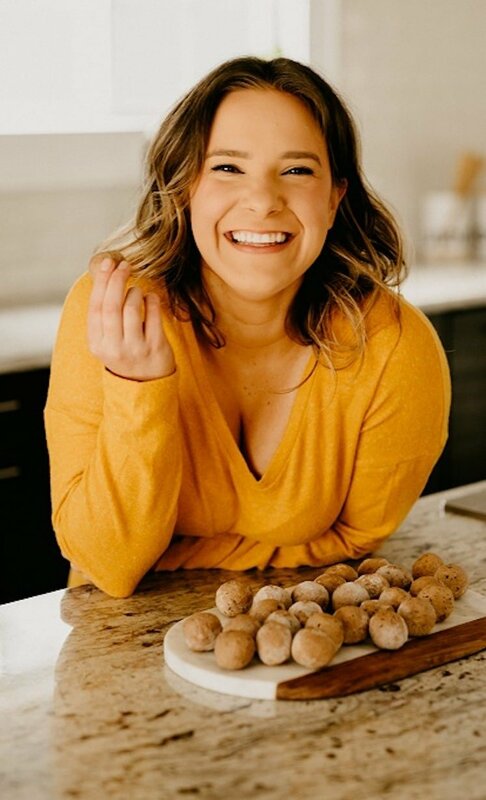 These bagels are sweetened and dusted with my favorite calorie-free, net-carb-free, and all-natural sweetener, Lakanto Monk Fruit Sweetener, which is a product that I consider to be a pantry-necessity! 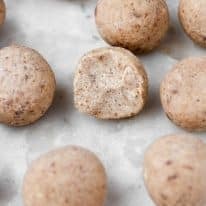 I love monk fruit sweetener because it tastes exactly like traditional sugar, yet it doesn’t spike your blood sugar nor will it kick you out of ketosis. If you are looking for a sweetener that tastes like sugar and is low-carb- and keto-friendly, I highly recommend trying Lakanto Monk Fruit Sweetener! You can use code “REALBALANCED” for 20% off your total order! 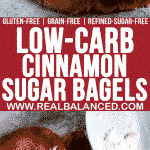 These Low-Carb Cinnamon Sugar Bagels not only are, you guessed it, low in carbs, they taste EXACTLY LIKE A BAGEL. I swear. It’s almost too unbelievable to be true, so I decided to not question it. Even Ryan agreed that these bagels taste exactly like a traditional store-bought bagel. SUCCESS! These keto bagels can be enjoyed straight out of the oven or, my personal favorite, cut in half and toasted in the toaster oven for a couple of minutes. Golden-y brown with some cream cheese on top? YES, PLEASE! 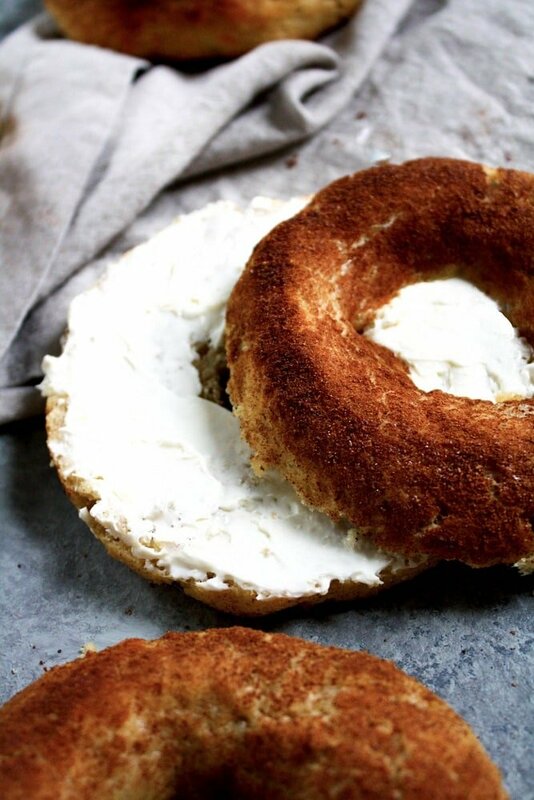 With only 5.6g net carbs per bagel, these Low-Carb Cinnamon Sugar Bagels will satisfy both your craving for bread AND your sweet tooth! This recipe is low-carb, gluten-free, grain-free, vegetarian, and refined-sugar-free. 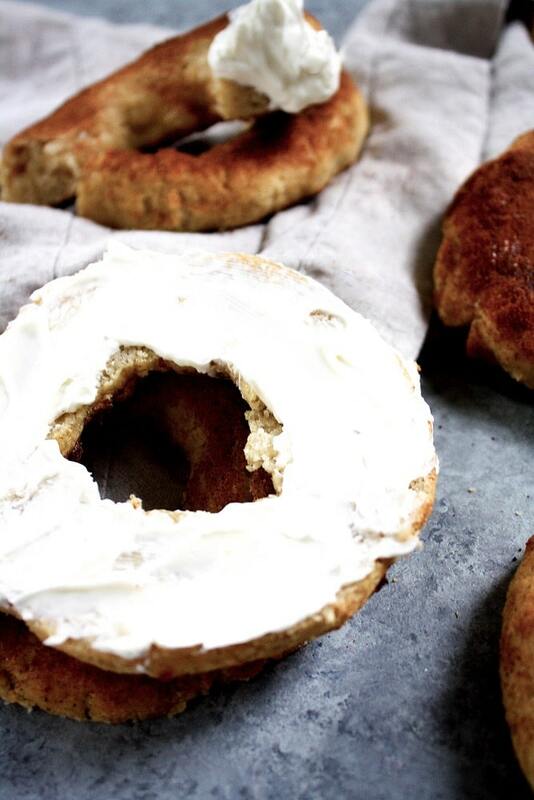 At only 5.6g net carbs per serving, these Low-Carb Cinnamon Sugar Bagels are about to be your new favorite breakfast! This recipe is low-carb, gluten-free, grain-free, vegetarian, and refined-sugar-free! In a large bowl, whisk together almond flour, coconut flour, baking soda, cream of tartar, 1 tbsp monk fruit sweetener, and 1 tsp cinnamon. To a microwave-safe bowl, add mozzarella and cream cheese and microwave for 90 seconds. Remove bowl from microwave and stir ingredients together. Return to microwave and microwave for another 60 seconds. Stir together until mozzarella and cream cheese are completely combined. In a separate small bowl, whisk together 2 eggs. Add whisked eggs to large mixing bowl of flour. Transfer cheese mixture to large mixing bowl of flour and eggs. Using your hands, knead together the dough until well-combined (flour and cheese must be combined completely before moving ahead to remaining steps). Divide dough into 6 equal portions (I used a food scale to make sure mine were precisely divided). Using your hands, gently roll each of the 6 portions into a log shape, attaching the two ends to make the log into a circle. Place on prepared baking sheet. In a bowl, whisk remaining egg. Using a pastry brush, brush egg wash over bagels. Combine remaining 2 tbsp of monk fruit sweetener and remaining 2 tsp cinnamon and sprinkle on top of egg wash on bagels (I used a mesh strainer to ensure cinnamon sugar was evenly coated on bagels). Bake bagels for 12-14 minutes, watching the bagels carefully the last few minutes to ensure cinnamon doesn’t burn. Remove bagels from oven and allow to cool for at least 15 minutes (NOTE: it is important to allow them to cool before eating as the inner part of the bagel will finish cooking during this time). Hi! I wanted to know if you could bake this as a loaf instead? I am so in love with these bagels! I’m not entirely sure! I’ve never tried, but you certainly could and I bet the flavor would taste just like the bagels! If you try, please report back on how it went. 🙂 I’d love to know! These bagels are beyond amazing! I think I could this everyday for the rest of my life! YAY! So happy to hear that you enjoyed the recipe, Serenity!!! ? 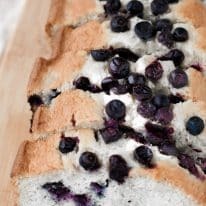 Thank you for taking the time to leave a comment and recipe rating! 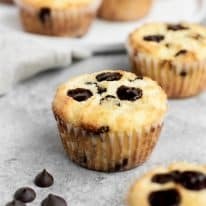 I’m new to keto cooking and have a question–are sweeteners interchangeable according to preference, or will the recipe only work correctly with monkfruit sweetener? Looking forward to trying this one, but I only have granulated stevia on hand and don’t want to waste my time if the monkfruit is a must-use. Hi, Maria!! Great question! So, some low-carb sweeteners are similar, but, depending on the brand, stevia and monk fruit are quite different in terms of taste (specifically aftertaste) and texture. While I personally think monk fruit sweetener is the best tasting low-carb sugar alternative, Swerve or erythritol should work as a replacement. Hope that helps!